If you love fantasy, time-travel, and adventure, delivered through inspirational, melodic, and mystical prose, you’d be hard-pressed to find anything more original, satisfying, or motivational than “Portals in Time: The Quest for Un-Old Age” by John Joseph Teressi. Grippland is in dire need of a remedy for the premature aging of its civilization. At risk of extinction, scientists begin human trials sending citizens (known as Gripps) on expeditions to find a cure. Unfortunately these travelers disappear, never to be heard from again. Are they lost in time forever or have they suffered a fate even worse? Assured that all necessary adjustments have been made to the program, the latest “volunteers” are selected from citizens imprisoned for faults against Grippland society. These Gripps are promised their freedom and other substantial rewards upon the completion of a successful mission. From here the story begins, with the Grippland Eye of Time Exploration Team as they navigate through the trials and tribulations of a new world in their efforts to succeed. There is so much going on in this story I hardly know where to start, but it has to be with the characters – so many delightful characters. The Gripps will drive you insane with their inability to grasp any concept on any level outside of the ideas that have been ingrained within them over time. Regardless of the peril, these Gripps simply do not get it! Readers might find a bit of themselves or someone they know within each character as they navigate through the adventures of the well-intentioned but misguided Gripps. The secondary characters, although none of them actually felt secondary, are colorful, exciting and literally out-of-this-world, as are the fantastical scenes within the incredible world of Acronos. Fabius and Filloloper, the Guardians of Acronos, are knowledgeable and wise and try to help the Gripps, but their efforts are often met with distrust and animosity. They are saints in my book with the faith they place in the Gripps, even though time after time the Gripps fail to “get a grip” so to speak. There is a lot of metaphysical wisdom and influence in the story. As the Gripps face some of their biggest fears, it is clearly exhibited that what you think becomes your reality. The consequences of the Gripps’ actions (and sometimes inactions) are brilliantly described through Teressi’s unique and spellbinding delivery. In fact, this story is so well-written, it’s actually quite beautiful and I can only imagine the amount of time the author put into the story. In addition to the storyline text that flows effortlessly, Teressi’s characters are often reciting poetry and songs, riddles and rhymes, all in an effort to get through to his Gripps. The attention to detail provides readers with vivid imagery and focus. What a wonderful and creative imaginative mind. 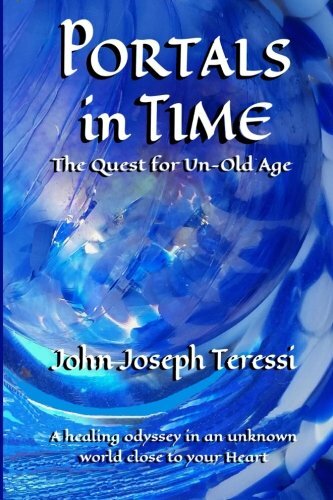 I thoroughly enjoyed “Portals in Time: The Quest for Un-Old Age” by John Joseph Teressi. Humorous, inspirational, adventurous, mysterious – it is a complex story full of elements to satisfy a wide spectrum of readers.